The chance to observe – freshly – an author's formative processes long after the completion of his work, and indeed his death, is rare, if not unique. 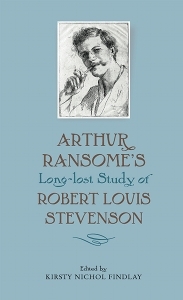 That is the fascination of the newly-published Arthur Ransome's Long-Lost Study of Robert Louis Stevenson (to give it its full title). The draft manuscript, posted off for unknown reasons by his wife Ivy in 1914, lay undisturbed in its parcel awaiting collection in a solicitor's office until 1990. It has taken a mere 21 further years, but the manuscript has now been published, in an extremely handsome edition, edited by Kirsty Nichol Findlay with many helpful footnotes and a warmly sympathetic introduction. This includes biographical coverage of the relevant period of Ransome's life that compares very favourably with Ransome's own brief biography of Stevenson. The 'Stevenson' was intended to be the third of Ransome's literary studies, following on from Edgar Allan Poe and Oscar Wilde. These had been reasonably well received, though they now seem clotted, opaque and convoluted, the work of a still-young man (and a college dropout) trying to convince the world, and possibly himself, that he is a serious literary scholar. They are a difficult read and, frankly, not a lot of fun (I sometimes wonder how Lord Alfred Douglas had the patience to discover the alleged libel in the Wilde book). There is some of this in the Stevenson book, but it is soon broken down under the force of Ransome's respect and affection for his subject. Energy and engagement break through, egged on by some vigorous phrasemaking – Ransome's description of Stevenson as 'a penny whistler in the orchestra of English literature' is entirely affectionate, not in the least derogatory, inspired by a self-deprecating self-assessment by Stevenson himself, and a shared love for the modest but surprisingly subtle instrument. Ransome also alludes to 'a fugue of skilfully disguised alliteration' – a phrase guaranteed to send some readers rushing off to hunt up some examples. There are also the odd intriguing asides. When, for instance, did Ransome 'happen to be in company with some keepers of performing bears'? I don't recall that in the autobiography. Particularly in the later sections, to do with fiction, Ransome seems to be wrangling with Stevenson – about realism (a term Ransome, significantly, objects to, preferring 'ordinary life') vs the life of the imagination, or about the virtues of storytelling compared to the 'high poetic functions' of supposedly greater novelists. Here one can tangibly feel Ransome the pupil learning from his mentor by writing a critique of him, and, one suddenly feels, the groundwork is being laid for Ransome's own unique and potent approach to his Swallows and Amazons adventures. Their ostensible realism – actual places, ordinary activities – conceals a charmed, imaginative world that is, in its own way, just as magical as Narnia (though a lot less dangerous). Ransome's study was unfinished when it was parcelled up, and he set off for Russia, in the May of 1914. So, ironically, he has not got round to a detailed examination of Stevenson's own unfinished masterpiece, The Weir of Hermiston, though there are plenty of indications that Ransome held it in high regard. I've always felt we should thank Douglas, Ivy and Russia for cleaning and simplifying Ransome's style and shaking out his ideas – but it's clear now that this process was already under way as he wrote his Stevenson.